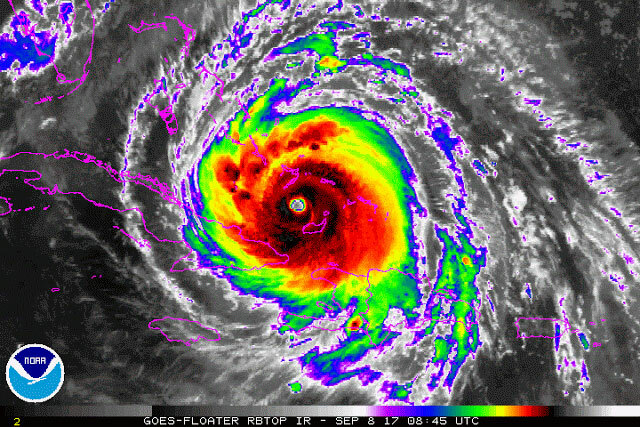 Hurricane Irma traversed the southern Turks and Caicos Islands this morning as a strong category-4 hurricane. Irma continues to track WNW towards The Florida Straits. The National Hurricane Center (NHC) advisory on Hurricane Irma issued early Friday morning provides a text forecast of potential storm surge heights. The forecast describes these surge heights as potential inundation levels above normally dry ground if the peak storm surge occurs around the time of high tide. The NHC text forecast provides the following potential inundation levels. This forecast places the entire metro Miami area, the Florida Keys and the coastal Everglades in the 5-10 foot storm surge range. 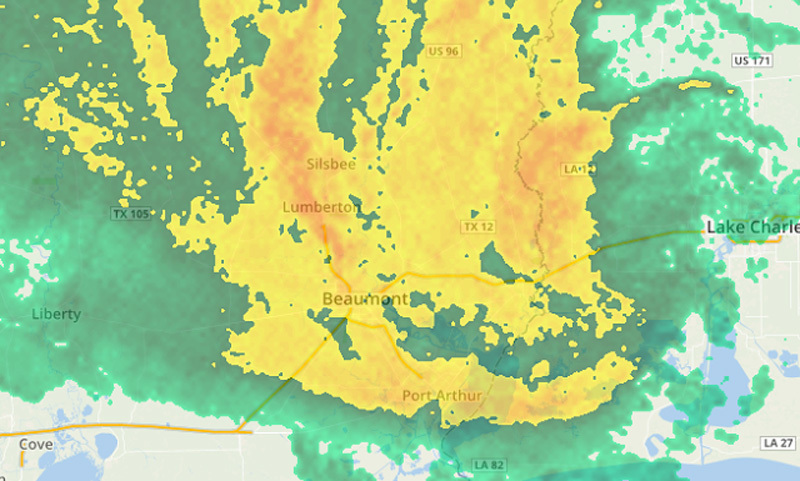 The NHC provides a storm surge probability tool that enables users to visualize the likelihood of storm surge inundation above a user-defined threshold. 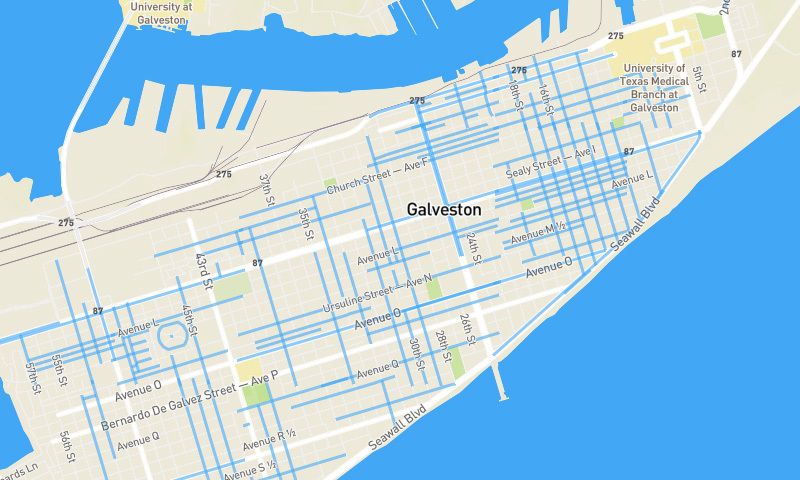 This tool provides useful insights for people who are concerned about a certain water level, such as a storm surge level equal with their home elevation. 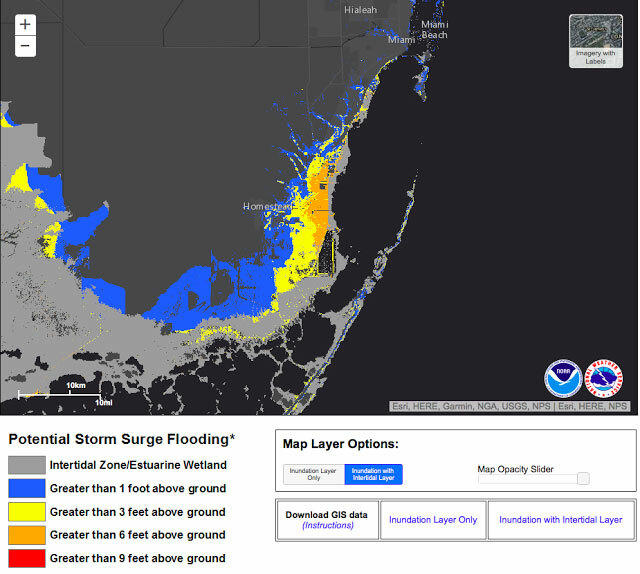 The map below depicts the likelihood of a 3-foot storm surge inundation, depicting a local maximum in South Florida of greater than 50 percent near the southwestern portion of the Everglades. Shallow bathymetry (offshore water depth) in this area will enable local storm surge maximums to develop on the "back" side of Irma, when winds blow from the southwest after Irma's closest approach. Relatively deep bathymetry near the Miami area explains the low probability of inundation in that region. Note the broad area shaded purple along the Georgia and southwest South Carolina coasts. This depiction may seem surprising, but it is not a mistake. Even though Irma is forecast to weaken as it moves inland along the Florida Peninsula, storm surge levels in places like coastal Georgia will likely exceed levels in places like Miami, which should observe more powerful winds. The concave shape of the coastline and shallow bathymetry enable storm surge to efficiently pile up from around Jacksonville north to Hilton Head Island, including the entire Georgia coast. 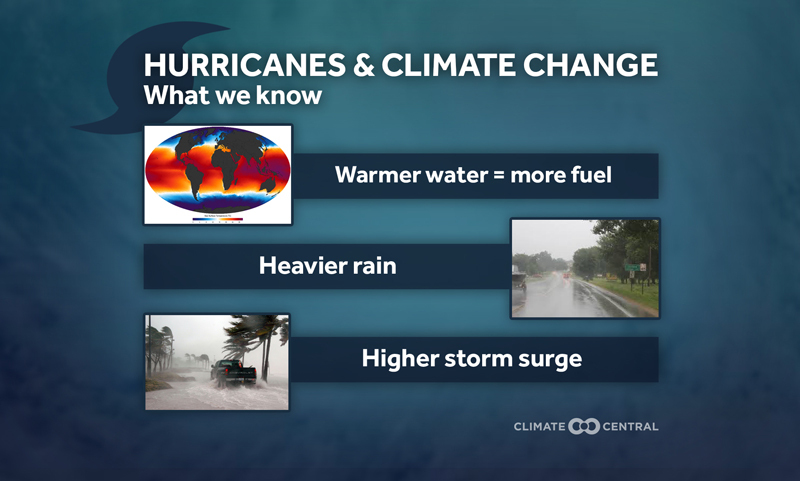 A major public awareness challenge in Irma will be helping people to look beyond the center of Irma's track and category, which is based on maximum sustained winds, but is not indicative of rainfall or storm surge threat. Life-threatening storm surge can be expected in places like coastal Georgia, even as Irma is downgraded to a lower category hurricane or a tropical storm. My blog post from last October provides an overview of the surprising storm surge history along the Georgia and southwest South Carolina coast. Although hurricane activity have been quiet there in recent decades, the area observed hyperactive hurricane climatology in the late 1800s, including a storm tide (storm surge plus tide) as high as 12 feet in 1893 and 18 feet in 1898. 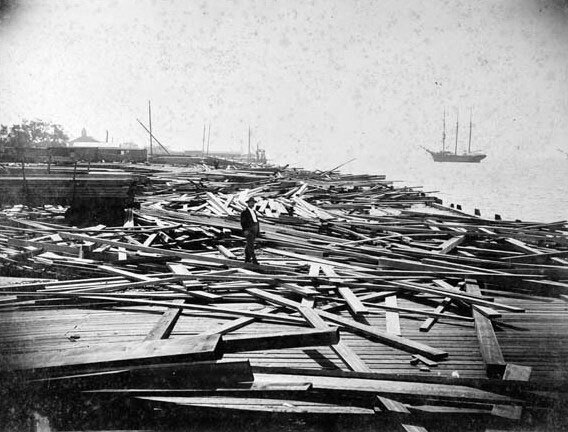 The Great Hurricane of 1898 generated a 16-ft (4.88 m) storm surge at Brunswick, Georgia, completely devastating the harbor. Although Irma's storm surge level will not likely reach this high in coastal Georgia, the region is starting to observe elevated hurricane activity, similar to the 1890s. Last October, Hurricane Matthew generated a storm surge generally ranging from 4-8 feet in northeast Florida, Georgia and southwest South Carolina. The surge at Fort Pulaski, Georgia, reached 7.7 feet. In retrospect, Matthew may have provided some benefits, such as raising public awareness of storm surge risk, before Irma threatens to provide a greater inundation this year. 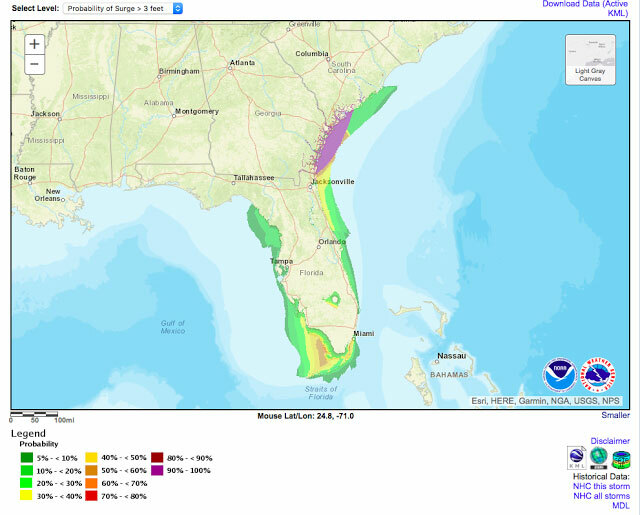 The National Hurricane Center Potential Inundation Tool provides users with a map that depicts possible inundation of normally dry ground, for the worst 10 percent of possible storm surge scenarios. In other words, based upon Irma's forecast track, size and intensity, if a model ran 100 possible storm surge scenarios, this map depicts the lowest level that was inundated at least 10 times. 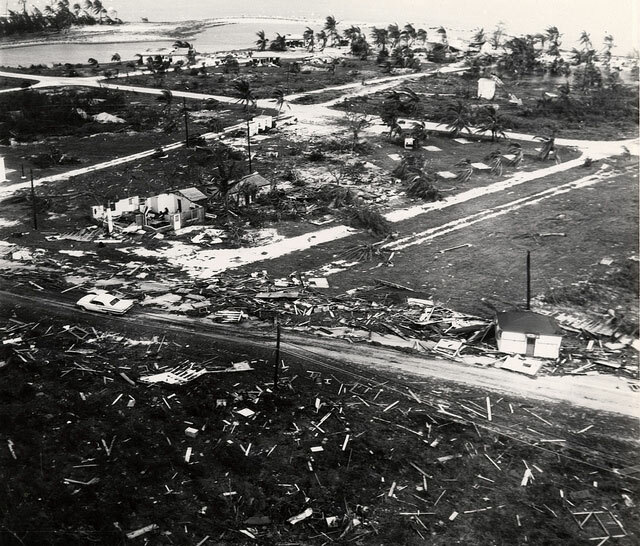 Hurricane Donna devastated the Florida Keys and much of the Florida Peninsula in 1960. Photo credit: Florida Keys Public Libraries. In areas of the southwest Everglades and southwest portion of Biscayne Bay, east of Homestead, this level exceeds 6 feet above ground level. The zoomed in map below depicts the broad area vulnerable to storm surge inundation east of Homestead, as well as a narrow strip of land vulnerable to 3-6 foot storm surge inundation in the southwest Miami metro region, including portions of Coral Gables and Coconut Grove. This tool is not currently active for northeast Florida, Georgia and South Carolina, but we can expect the mapped area to shift as Irma moves north. The storm surge probability tool and long-term climatology suggest that places like coastal Georgia will be a likely hot spot for Irma's storm surge, and local residents should begin taking action immediately to protect their lives and property from salt water flooding. These tools shown above are excellent additions that have been added in recent years to the NHC's suite of hurricane tools. They are generally based on modeling output from the SLOSH model. In addition to these modeling outputs, it's important to reach back into observed storm surge history to provide some context for storm surge forecasts. Although every hurricane is different, historical data provide us with an opportunity to see geographic patterns in storm surge inundation and form some ideas about places where models may over- or under-predict storm surge levels. Hurricanes King (1950), Donna (1960) and Cleo (1964) approached the middle to upper Florida Keys from the southeast or south-southeast, and then tracked north along the Florida Peninsula. As I compared the characteristics of these storms to Irma, I chose Donna as an analog storm for comparison. Donna approached the middle Florida Keys as a Category 4 hurricane with maximum sustained winds of around 132 mph. The center of Irma's circulation will take it near this area or farther east, but Irma is likely to be more intense with forecast wind speeds in this region of around 155 mph. Both Donna and Irma have comparable geographic size, which is important, because both maximum sustained winds and storm size influence storm surge levels. Irma's radius of maximum winds, which essentially measures the distance from the center of circulation to the eyewall, was holding steady at around 15 nautical miles last night, whereas Donna's radius of maximum winds was measured at 20 nautical miles. The size of Irma's eye may fluctuate somewhat as it tracks towards Florida, but it seems that Irma and Donna generally have comparable sizes. 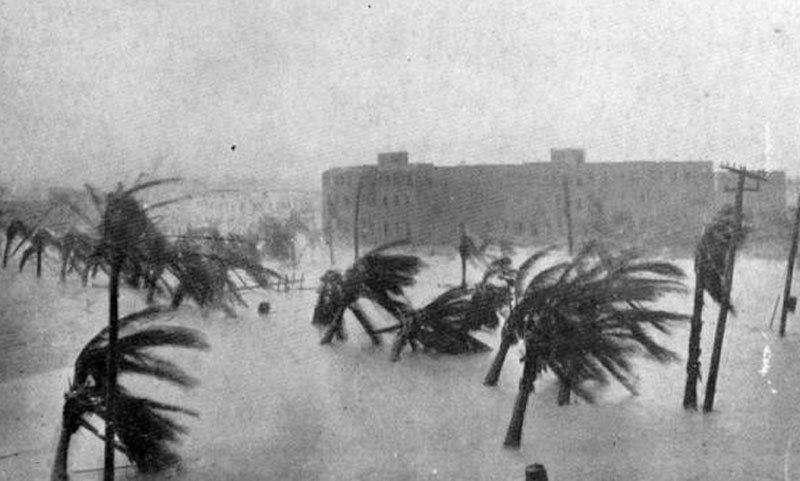 By contrast, Hurricane King (1950) struck Miami as a small hurricane, with a tightly-wound radius of maximum winds only extending 5 nautical miles. 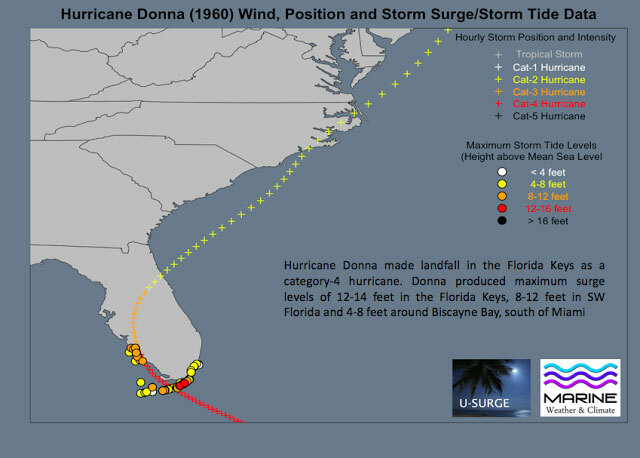 The U-Surge Project provides 92 storm tide observations for Hurricane Donna. The map below provides a plot of these observations, along with the hourly spline-interpolated hurricane position and wind speed, provided by researchers at Florida State University. Donna's storm tide map provides a few interesting insights, as Irma approaches South Florida. Donna generated a storm tide exceeding 12 feet to the east of landfall along the Florida Keys. Tavernier, Upper Matecumbe Key and Islamorada all observed storm tide levels exceeding 12 feet, with a maximum observation of 13.7 feet at Tavernier. Irma's track will differ from Donna's and this means a different configuration of storm surge levels, as storm surge is sensitive to slight changes in a storm's track. Nonetheless, if Irma's forecast verifies, it has the potential to generate higher water levels than Donna in the Florida Keys, and storm surge could reach around 15 feet, which exceeds the NHC text forecast by 5 feet. Donna's map depicts numerous storm tide observations ranging from 4-8 feet in the Biscayne Bay area just south of Miami. As Irma will likely make landfall farther east than Donna, with higher sustained winds and comparable size, Irma's storm tide near Biscayne Bay will likely exceed Donna's. We should expect storm tides of 6-10 feet near Biscayne Bay, and potentially higher than 10 feet if Irma's track brings the eyewall over the bay. Donna tracked far enough west that it made a landfall in southwest Florida. Irma will likely stay to the east of this. Therefore, Donna's 8-12 foot storm tide near places like Naples will not likely be reached in Hurricane Irma. All of these observations are meant to provide context and should not be taken as a literal forecast. However, as hurricane and storm surge models improve and the observational record grows, our confidence in storm surge prediction should continue to increase with time. It's really too early to make an educated guess about storm surge potential in northeast Florida, Georgia and South Carolina. However, keep in mind that this area has all the ingredients to generate substantial storm surge inundation, even from a minor hurricane or tropical storm. Thank you for your interest in storm surge science and best wishes to everyone in Florida, Georgia and the Carolinas, who may be impacted by Irma!